Argor-Heraeus is one of Switzerland's most prominent precious metals refineries, and a manufacturer of investment grade platinum bars for retail precious metals investors. 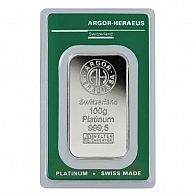 Argor-Heraeus manufacture platinum bars in a range of sizes from 1 gram to 1 kilogram, with 1 ounce and 100 gram bars being the most popular. 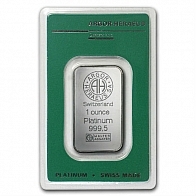 Argor-Heraeus also manufacture platinum bars for UBS, one of Switzerland's most prominent banks. 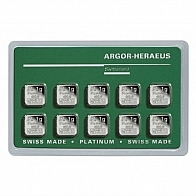 Argor-Heraeus platinum bars are available for VAT-exempt Swiss storage or for delivery worldwide.